When a school is closed or given over to private developers, affected communities cry foul, and cry loudly. But it's not just the loss of a building, or the inconvenience of sending children farther afield for their education, that strikes a community as unjust. 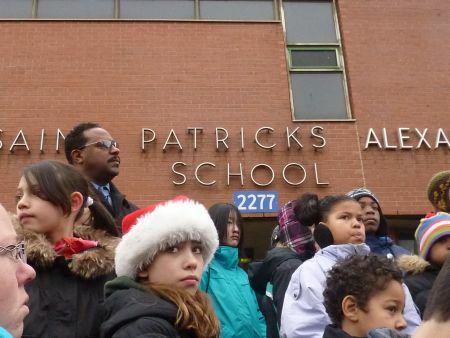 "When you take a school out of a neighbourhood...when you take away what holds and binds people together, the community falls away," said Reverend Rhonda Britton of Cornwallis Street Baptist Church, addressing a crowd of 150 people who gathered at St. Patrick's-Alexandra school in December. "We will fight to keep our neighbourhood." Halifax City Council's acceptance of a private bid for the St. Pat's-Alexandra school, which closed its doors in June 2011 when students left for the summer, has been the subject of intense criticism from North End residents, neighbourhood organizations, media and the wider HRM community. 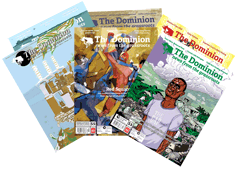 Council's processes, both in its call for bids and its decision to accept an offer from Jono Developments, violated its own policies and showed lack of respect for the neighbourhood that can be only interpreted as racism, say community and media critics. But the fiery controversy around the sale of the North End school (to be replaced with condos) is not unique. The closure and privatization of schools and former school buildings in marginalized communities--a provincial trend--touch those communities in a particularly sensitive way, threatening their collective identities, and their very existence. Rural communities are particularly vulnerable, as the provincial funding formula for schools is based on enrollment. Trends show declining enrollment in rural communities in Nova Scotia, translating into fewer education dollars, and eventually, the closure of rural schools. Communities all over Nova Scotia have been resisting the closure of their schools. In the past two years, groups have sprung up to save schools in Weymouth, Antigonish, and Halifax, as well as forming the Save Community Schools, a province-wide coalition of concerned parents. When the Margaree Forks District School (MFDS) in western Cape Breton was slated for closure in 1990, citizens of the area mobilized with urgency. Recognizing that the enrollment-based funding formula would always work against schools in rural areas, citizens of Margaree undertook a lobbying and awareness-raising campaign to change that formula, but the province refused. "We fought so hard to keep [MFDS] open because the school was the one thing that bonded all the Margarees. It brought the community together," says Luella Chiasson, a former student of MFDS who helped organize a four-night occupation of the school in 1996, which sparked a series of student occupations and walk-outs in the region. "Nothing was more evident than after we locked ourselves in [the school] and the community came out to support us in any way they could." The Margaree Education Coalition (MEC) coordinated a series of three "Kitchen Forums," 88 neighbourhood meetings in all, that sought to identify the community's vision for education of its children. MEC drafted a strategic plan for community-based public schools, which would still use the provincial funding formula, but would also lean heavily on the resources of the community. It published the strategic plan in a 2000 report, The New Learning Guide: Education opportunities, alternatives and enhancements for maritime communities. The school in Margaree was eventually closed, and replaced with a Public-Private Partnership (P-3) school on the outskirts of the community, although Chiasson says the spirit at the new school is still high. "Students, teachers and visitors alike will say the spirit of our community is amazing. It moves you," she says. The loss of a school in a rural community contributes to the decline of that community, which is already vulnerable to the forces of urbanization and economic restructuring, says Dr. Paul Bennett in his book, Vanishing Schools, Threatened Communities: The Contested Schoolhouse in Maritime Canada. A rural community without a school is not particularly attractive to young families, who must consider long bus rides for their children and lengthy travel for themselves for parent-teacher meetings and extra-curricular activities. The loss of a neighbourhood school threatens urban communities in a similar way. "In the last few years, people who have written off the North End have begun to see that it is a prime location for people who work downtown," said Reverend Britton at the December rally. "They see it has a certain vibe that makes it attractive and a trendy place to live. And now we witness the gentrification of the neighbourhood as developers grab as much of the land as they can to build condos and high-rises, while our children do not have the necessary services that they need to survive--to thrive." Reverend Britton reminded the crowd that the sale of St. Pat's-Alexandra was only the latest in a series of betrayals by city and school officials. The decision to close the unique school--one of the few in Nova Scotia with Africentric curricula--was fought hard by residents and neighbourhood groups. She didn't have to mention the history of Africville, where Black Nova Scotians, already living with toxic industries in their neighbourhood, were forced out of their community in the North End by city re-zoning. "The city is robbing the North End of a $6 million asset, and putting it elsewhere," says Jane Moloney, executive director of the North End Community Health Centre (NECHC). The Centre, which has been serving the North End for 40 years, was involved in the bidding for the St. Pat's-Alexandra building. "The sense is, we have so little, and they're taking that away, threatening our existence. "What we are hearing is that residents are afraid. A lot of people here are residents of Uniacke Square...and they worry that they will not be valued as neighbours [if condos are built on the school site]. They feel the value of keeping their community is under threat." Moloney speculated that condo-dwellers demand trendy cafes and expensive restaurants, which do not meet the needs of the North End community, which has no banking or grocery services. "To whom is the city responsive?" she said. After St. Pat's-Alexandra was closed in June 2011, the city of Halifax opened its bidding process with a short time-line that already put community organizations--often operating on volunteer labour--at a disadvantage. The NECHC submitted an "expression of interest," which requested that the city, as a condition of the sale, require the successful bidder to turn over a smaller building on the site to the NECHC, which would meet the NECHC's growing need for space. Neighbourhood organizations are permitted to pursue expressions of interest in light of their relative lack of resources to develop a full bid. But instead of evaluating the expression of interest as such, the NECHC's submission was scored as a full bid. The NECHC never received a response from council on its proposal regarding the smaller building. It was discovered later that council had ignored another policy, put in place in 1999, that guaranteed community consultations on the disposal of closed school buildings. However, instead of voting to repeal its decision on the sale of the school in light of this new information, council voted to scrap the policy itself. The Mi'kmaq Friendship Centre and the Richard Pres­ton Centre for Excellence also submitted bids for the St. Pat's-Alexandra site. When the decision to close a school is presented in terms of dollars and cents, the case seems clear: close schools with declining enrollment, transfer students to another school, and save money by sharing resources among more students. However, this is because the provincial per-student funding formula functions on a market model of supply and demand. With funding based on enrollment, a school's productivity is measured simply by the number of students it graduates, and says nothing about the quality of the education they receive. Such a formula fails to account, for example, for the richness that keeping a school within a community can offer. According to a 2006 report by Dr. Michael Corbett of Acadia University and Dennis Mulcahy of Memorial University, "small schools do a better job of educating children." After a school is closed, the municipality can sell it off, making money off the real estate and buildings. In the case of the St. Pat's site, councillors were given information on the monetary savings a private sale would provide the city. This financial picture seemed to trump the sense that a city ought to follow its own policies. Councillors were not asked to take into consideration the value of that infrastructure to the health of the neighbourhood--where public services and community groups could create a space of cohesion and empowerment. "We were required under the [Request For Proposals] to answer the question: how would our proposal meet the mandate of the city?" said Moloney. The NECHC had to demonstrate that its use of the facility would conform to the vision outlined in HRM By Design, as well as energy and recreation guidelines set by HRM. NECHC's "bid" scored 63/100. Since financial considerations were given 40 points, and NECHC's submission was not financially strong, Moloney reasons that the score reflects that the health centre's proposal must have otherwise met the city's own mandate for use for St. Pat's-Alexandra. "If we moved into the school, we would be moving back into the heart of the community we serve," she said. Bennett points out in his book that education is a key location for popular struggles--essentially people fighting to keep their homes and ways of life. "We're scared [the city is] going to rush this process through and give a demolition permit [to Jono Development]," said Moloney. "The cost of a new building will be $15-20 million," putting further out of reach the possibility of community organizations purchasing the space. "We're worried they're going to knock it down, and knock it down fast, so we stop fighting it. And if I feel this way as someone who works here, I can't imagine what it must feel like for the people who live here." Moira Peters grew up in Margaree and was involved in the mobilization to save the community's school. This article is the first in a series of articles about the closure and privatization of public schools in Nova Scotia. Submitted by Moira Peters on Fri, 02/10/2012 - 12:35. Education Minister Ramona Jennex announced today, Feb. 9, the Community Use of Schools Grants Program, part of the Kids and Learning First education plan. The grants will improve access to school facilities and promote healthy, active living. At least 100 schools will benefit from the program. "These grants will strengthen schools as the heart of our communities," said Ms. Jennex. "Welcoming parents and community members into schools is a key objective in the Kids and Learning First plan." The grant program will provide a total of $660,000 per year to school boards to help with the costs of using school facilities after hours. The funding will help increase access to school facilities at times when schools are not in use.